Image 1. 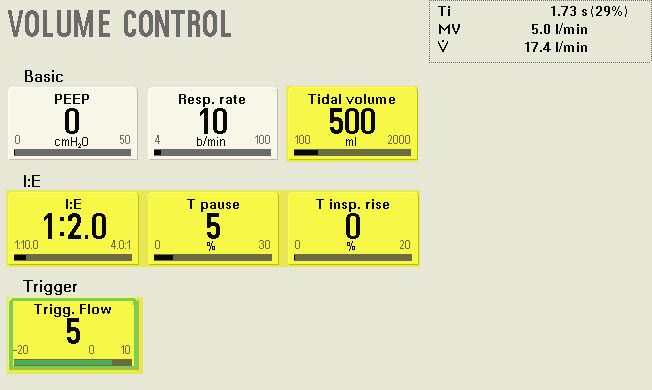 Settings within "Volume Control" a VC-CMVs modality on the FLOW-i anesthesia Delivery system. 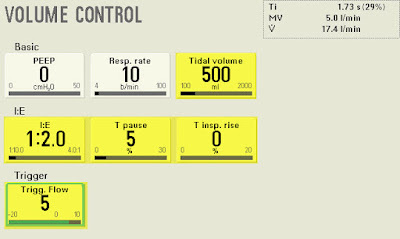 All highlighted settings may affect patient comfort. My first episode of my new video series is now available to my news letter subscribers. I posted a teaser video on YouTube (see below). Note- if you signed up to receive my news letter and do not have it in your "in-box" please check your spam folder. To receive these extra videos please sign up for my free news letter by following the link on the page "News Letter". These videos have been conceived from the following two journal articles. Respir Care. 2014 Nov;59(11):1747-63. doi: 10.4187/respcare.03057. A taxonomy for mechanical ventilation: 10 fundamental maxims. Chatburn RL, El-Khatib M, Mireles-Cabodevila E.
Respir Care. 2013 Feb;58(2):348-66. doi: 10.4187/respcare.01839. A rational framework for selecting modes of ventilation. Mireles-Cabodevila E, Hatipoğlu U, Chatburn RL. I recommend reading both articles to obtain a deeper knowledge and appreciation for the different modes of mechanical ventilation.